complex is one of many recent construction projects. He might be called the train’s conductor. After serving two terms as a city councilman, Brown is now into his second term as mayor of Radford — a city of 17,441 — so he knows Southwest Virginia, and especially his hometown, as well as anyone. A recently retired professor and administrator at New River and Wytheville community colleges, he uses words like holistic, dynamic, fluid and synergistic to describe the university’s impact on his city. Brown is now an adjunct professor of management in the university’s College of Business and Economics. That’s been true since 1910 when Virginia’s General Assembly established the State Normal and Industrial School for Women to prepare more teachers for an expanding public school system. Still known for elementary and secondary education programs, RU now offers 69 undergraduate degrees, 21 master’s programs and three doctoral degrees in health-related sciences. Six presidents have steered RU, but the university credits the sixth (and first female) leader, Penelope Kyle, with an unprecedented growth spurt. Kyle announced in March that she will retire on June 30, 2016, and a search committee has been formed to find her successor. Since Kyle came to RU in 2005 after 11 years directing the Virginia Lottery, the school has received funding for more than $330 million in capital projects, and student enrollment has hit an all-time high at nearly 10,000, up from 9,552 in 2005. That activity, in turn, has boosted the local and state economies. Joe Carpenter, RU’s vice president for university relations, says its primary mission, however, has the greatest impact. As the city’s largest employer with 1,603 full- and part-time employees, RU is a “substantial contributor,” says Radford City Manager David Ridpath. He points to the fact that business licenses in the city through March are up 6.6 percent from 2014. Annually, business permits account for $6.7 million, Ridpath says, adding that property tax assessments grew from $790 million in 2010 to $795 million in 2015. Brown and Ridpath also point to success through collaborations between the city and the university. They include emergency services, public transit (up 12 percent from June to December 2014) student engagement with the city through internships and volunteerism and cooperation on events ranging from festivals to artistic performances to sports championships. “Athletics continue to grow in stature and performance,” says Brown. “We partner with the university on the Virginia High School League Spring Jubilee sports championship that brings thousands of student athletes and their families in early June for a variety of spring sports.” Additionally, the university has hosted the American Legion’s Boys State convention since 2013, drawing 800 high school juniors selected by their school districts for an intensive week of U.S. government-related activities. This year’s 73rd Boys State is June 21-27. RU encompasses most of Radford’s east side, with 204 acres and 65 buildings. Spanning only 9.8 square miles, the city is the New River Valley’s geographic center. It has a beautiful 100-acre park and recreational area with 8.5 miles fronting the New River. Biking, walking and hiking trails are amenities that enhance the town-gown marriage. Brown recognizes Kyle for “making a concerted effort to welcome people through construction planning,” noting the visual appeal of university entrances from all parts of campus. Recent construction projects include a $44 million College of Business and Economics complex, completed in 2012, and a $32 million Student Recreation and Wellness Center, finished last year. A $49 million Center for Sciences is nearing completion and a $52.8 million College of Humanities and Behavioral Sciences building is expected to open next year. A forthcoming economic impact study conducted by the university and the New River Valley Planning District Commission says RU spent more than $39 million on construction and renovation last year, with local businesses receiving 50 percent of contracts. It notes that the university’s annual spending in Western Virginia through salaries and operational expenses exceeds $100 million. Nonlocal students and visitors bring an extra $40 million to the region. The report credits above-average median incomes of faculty and staff with advancing area home ownership and consumer spending. The average income for full-time employees is $54,272. Regionally, according to the study, the “extra earnings” of university alumni (increases brought about by improved skills and career prospects) total $235.5 million, producing $181 million in sales at local businesses and supporting 1,493 jobs. The study notes that statewide extra earnings are $815.5 million. Del. Joseph Yost (R-Blacksburg), who represents Radford and other parts of the New River Valley in the Virginia House of Delegates, says “the profile of the university has skyrocketed during Penny Kyle’s time there.” Now finishing his second term, Yost is the commonwealth’s youngest delegate at 29. An undergraduate at RU when Kyle arrived, he earned bachelor’s and master’s degrees in criminal justice in 2006 and 2008. “I very much enjoyed the time I spent at Radford,” Yost says, recalling that “there was some head scratching going on over the fact that [Kyle] did not come from a traditional academic background, but that has not impacted her ability to do great things for the university. Serving as the head of the lottery positioned her well because she had contacts in Richmond. The university’s Small Business Development Center (SBDC) also affects the local economy, providing resources for startups and established businesses. With partial funding from a U.S. Small Business Administration agreement, the center provides planning and consulting services, as well as loan packaging assistance and information on business financing sources. Classes, workshops and customized training seminars are available. Kathy Stewart, owner of Montgomery County’s Professional Rehabilitation Associates, says the SBDC assisted her company, the only private provider of physical, occupational and speech therapy in the New River Valley. Best of all, Stewart adds, the help was free. 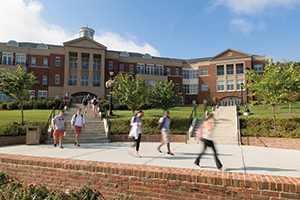 To support RU’s financial well-being, the Radford University Foundation was established as a nonprofit in 1973 to raise, invest and administer private donations. John Cox, who has served as executive director for more than four years, says the foundation advances the university’s growth in a number of ways. “We participate as an economic driver through our funding of scholarships at the university and other spending in support of the university,” Cox says. He explains that the foundation also encourages entrepreneurial education by providing internships and by funding the Student-Managed Investment Portfolio Organization (SMIPO), a student-run group getting hands-on experience through managing foundation money. The foundation jump-started the SMIPO in 2002 with $100,000 and has provided additional funding over the years. The group celebrated a milestone earlier this year when its small mid-cap value fund portfolio reached $1.2 million. Currently, the foundation owns real estate worth more than $11 million, and its total assets are nearly $74 million. “Total investments as of June 30, 2014, were almost $57 million,” reports Cox. “Of that total, a little over $47 million was considered endowed.” Foundation President Matthew Crisp noted in the 2014 annual report that for the fourth consecutive year, more than $1 million in financial support benefited RU students. “We are pleased to share that the foundation’s one-year and three-year returns rank in the 92nd and 86th percentile, respectively, placing our return-on-investment performance in the top 100 college and university endowments nationwide,” Crisp wrote. Tyler Hall was the school’s first official residence hall; sections opened in 1915, 1916 and 1923. Work to construct McConnell Library began during the Depression. In the 1970s, Radford began calling its athletic teams the Highlanders in recognition of the Scottish heritage of Southwest Virginia and changed the school colors from purple and gray to the tartan plaid colors of red, white, blue and green.